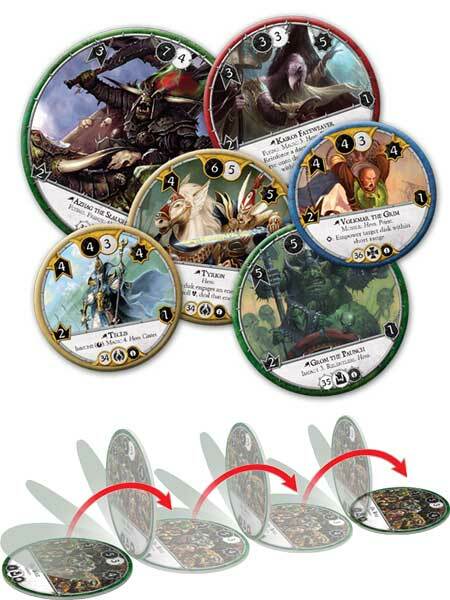 With a host of terrain cards, objectives, command cards, and more than sixty disks for the game’s four races, the Core Set includes everything you need to build your first armies and dive into the fray! Image a typical card game in terms of keywords and stats. Now round those pieces of cardboard. Make distance matter, add a command system, and add an element of chance. You get diskwars. To be honest the disk flipping mechanic is really gimmicky. It’s interesting that the same disk has some differences, but really it makes it more AP prone. Other than that, it is a solid game. Really easy to learn the rules, the only part I wasn’t 100% clear on if the LIFO resolution approach scrums (melees with multiple engagements). Looking at the rules a year later it seems to favor the reading that all disks both attack and a counter in engagements, which wasn’t intuitive to me at the time I first open up the game. Regardless a fourth example on the multiple engagements would’ve been nice. Wounding versus damage was interesting, it really helps abstract the concept of wounding in comparison to damage for some less experienced wargames. Simple dice and the range stick are only used in ranged attacks, this makes the gameplay fast. Command points by the numerical value on the cards was interesting especially because it has a RPS mechanic tied into as well. The command system doesn’t inhibit the turns and adds a bit of additional tactical flair by giving specific bonuses or disadvantages. The engagement mechanic, simply if there’s a disk on top of another disk, the disk below is pinned and cannot move off. It seems pretty nifty at first, but pinning happens quite frequently, it makes the disks hard to read (the disks being laden with information), and sometimes the engagement resolves with neither side dying, meaning in the next round the disk underneath isn’t going to be able to move. I would recommend it to anyone who is interested in wargaming, but doesn’t want to buy into a game system just yet. Try this cheap box out, and if you are interested in the style of game in a few months, pick a game you know you’d enjoy thematically. 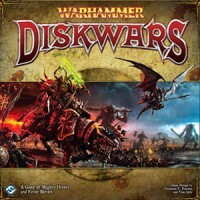 Add a Review for "Warhammer: Diskwars"